For many of us, there's just nothing like a big 'ol flat top model. Trumpeter's line of "short hull" Essex class kits started with CV-9 Essex as she was in late 1943 and continued to CV-10 Yorktown circa late 1944-45, and CV-13 Franklin in her 1945 fit. Significant ships, all, but there were some whose favorite ships were of the "Long Hull" type, and they champed at the bit for a long-hull kit! Some even started converting their short-hull models, ensuring that someone would release one before they finished theirs and put us out of their misery. The term "long hull" and "short hull" is somewhat deceptive, as the hulls weren't really any longer, at least not at the waterline. The short hulls had a fairly blunt bow and single quad 40mm mounts at the very bow and stern. The long hulls were an effort to add more AA to the class, and saw the structures at the bow and stern changed to allow for more mounts in these areas. The bow extended further forward in more of a sharper "clipper" shape to allow two quad 40mm tubs and their associated directors, and the stern had an extra extension build on that also allowed an increase from one to two mounts and directors. Along with this, an effort was made to increase these mounts firing arc and the flight deck at the bow and stern edges were cut back by eleven feet on the bow and 7 feet on the stern. Only three ships were launched with this configuration, and of those, only CV-19 Hancock went to war with it. Five long hulls were launched early enough to see service during the war, and CV-14 Ticonderoga was the first of these. Because of this, it is not uncommon for these ships to be referred to as the Ticonderoga class, even though there is not much different between the two. 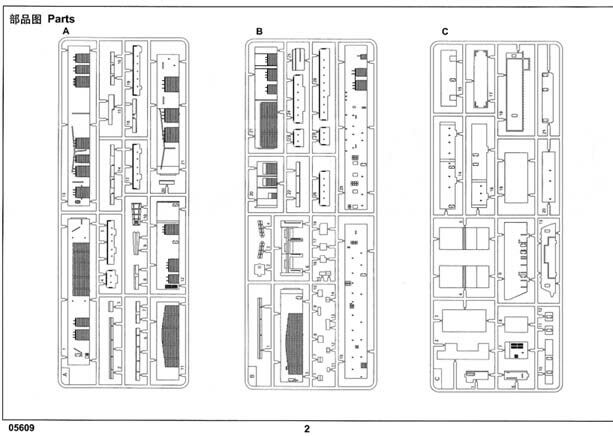 Other long-hulls that saw service were CV-15 Randolph, CV-19 Hancock, CV-20 Bennington, and CV-38 Shangri La. CV-36 Antietam was launched in January of 1945 but was only three days out of Pearl Harbor when the war ended. Trumpeter's latest release is CV-14 Ticonderoga, mostly in her early service fit, when she was in the MS33-10A dazzle scheme. 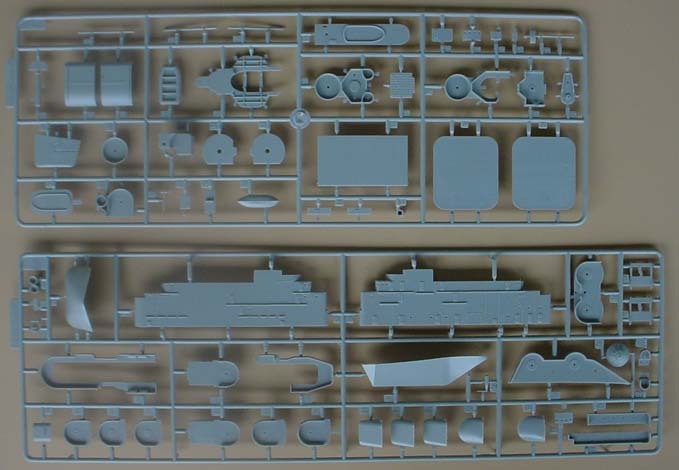 The box contains 689 crisply-molded parts for the ship and aircraft, a 20-page instruction sheet, a separate color-printed sheet for markings and camouflage, and a decal sheet. According to Trumpeter the kit is 774mm (about 30.5") long and 129mm (just over five inches) wide. 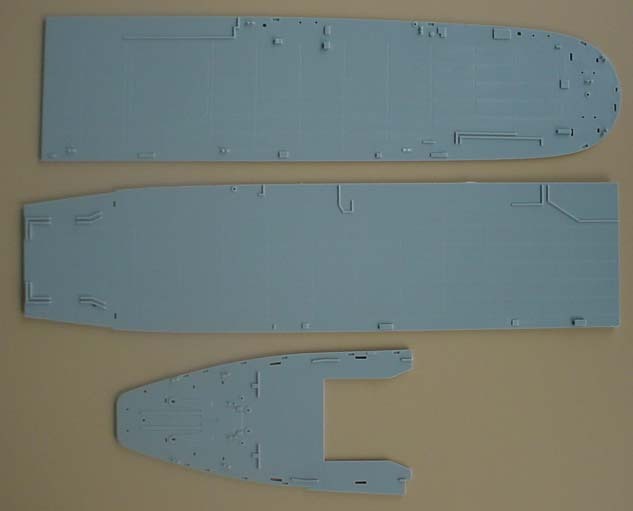 It is obviously based on the earlier short hull kits, with one new tree for new parts, new fore and aft flight deck pieces, and a new bow piece. The hull, rather than being designed for the new piece, is one of the earlier short-hull pieces that has actually had the bow cut off in the appropriate place. 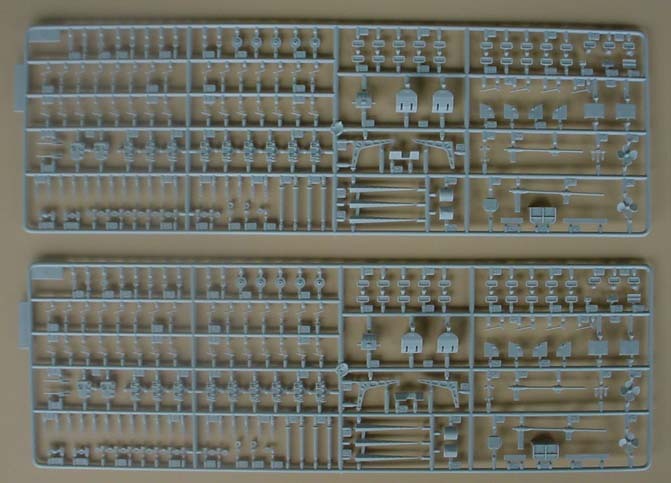 The new sprue is "H" and contains twenty parts ranging from some new bulkheads to gun director tubs. Since none of the long-hulls had the hangar catapult these ships had a different layout for the port side in this area as not as much of an opening was needed. Five roller doors were reduced to three with increased spacing between those, and parts H1 and H13 reflect this feature. 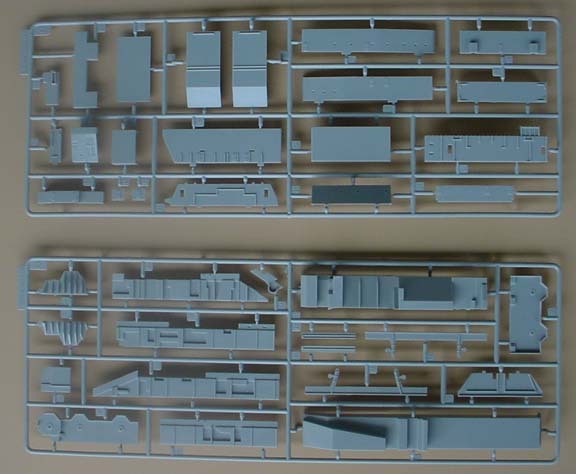 The sponson outboard of this bulkhead was turned into a platform for two quad 40mms and their Mk 51 director tubs and these are represented on this sprue as well as parts H8 and H4. A new platform for the forward open 5"/38 gallery and quad 40mm that was next to them is included to represent the later configuration where this quad 40mm was lowered and the notch in the flight deck above it filled to allow for better movement and spotting of aircraft. The original piece is also included, which is handy for reason I'll cover later. Other additions with this tree are some 20mm galleries, a revised platform for the bridge, and an SK-2 radar. 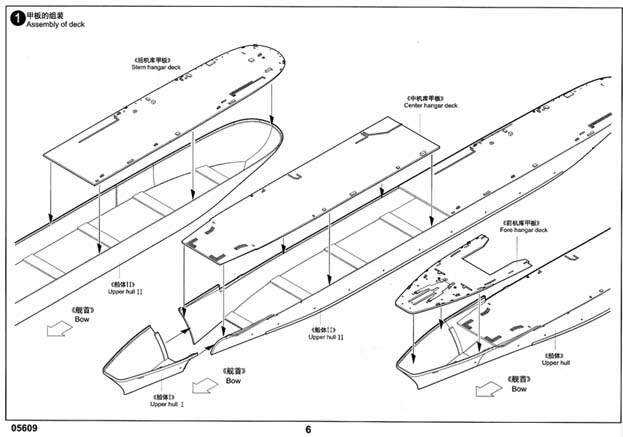 Sixteen aircraft are provided, four each of the SBD, F4U, TBF, and SB2C. 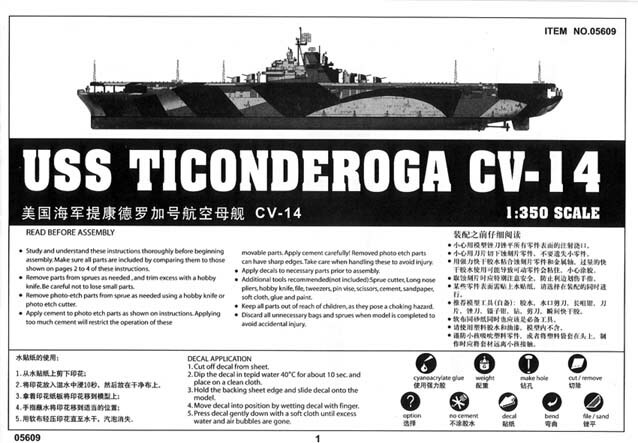 The instructions are the same as past Essex-class kits, updated for Ticonderoga's uniqueness. 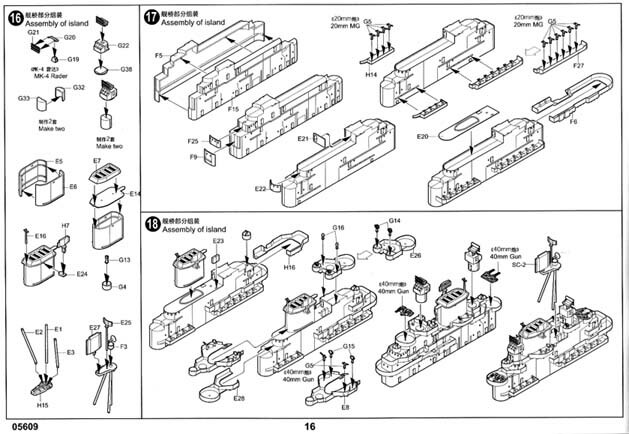 It is a total of 20 pages long and has excellent isometric views that do an excellent job of showing where parts and assemblies go. 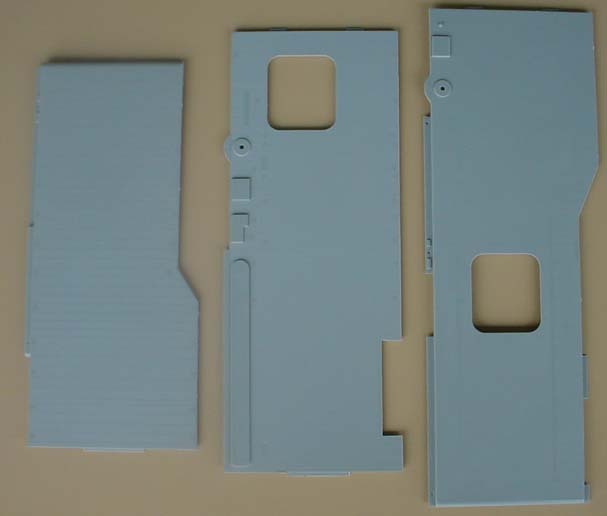 There are some "artifacts" such as holes for other kits but in the case of the Ticonderoga kit they shouldn't provide any confusion. The full color Paint & Marking Guide has three views; port, starboard, and top. Paint colors are in the standard Gunze Mr. Color references with the Navy's name for the colors but not the designation (Ocean Gray is 5O for example). Trumpeter has started representing the ships in these pieces with weathering and I'm so-so on this. It's interesting, but doesn't really reflect how these ships weathered and was a bit distracting to me. I have to admit that I can't be completely accurate with this review; I have photos but no plans. So I can't speak as to how dimensionally accurate the short deck is. 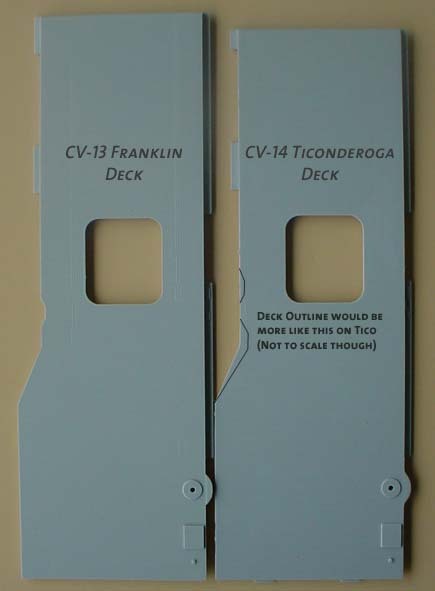 I can say that when placed side-to-side with my CV-13 Franklin kit, it's apparent that what they did is remove two "sections" (planks and tie-downs) from the bow and one from the stern. On the Franklin deck the starboard catapult ran up to the edge, on the Ticonderoga it stops short by one section. No changes were made to the port cat. 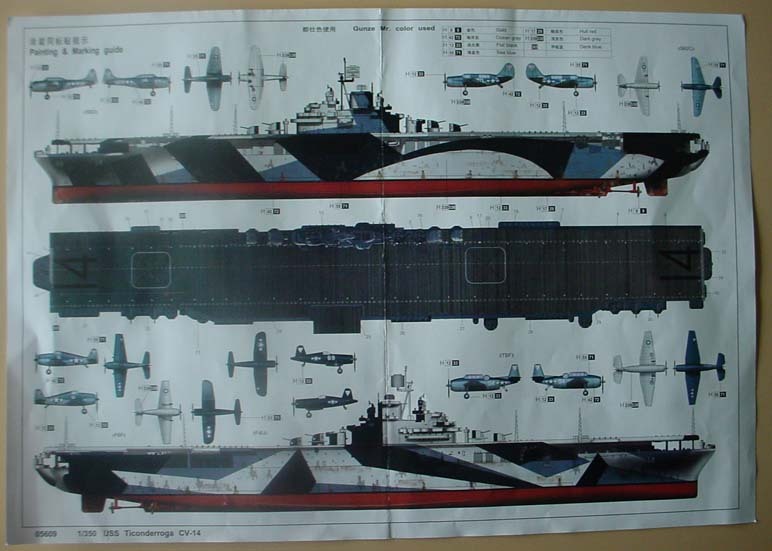 Will anyone notice that the starboard cat is about 17mm shorter than the port cat? Does it even matter? I don't know at this point but I'm fairly certain that the Navy wouldn't shorten it's cats for a mod like this. OK, here's where the people who think any criticism of a kit is a bad thing and treasonous to the shipbuilding community are going to start to hate me. I will state right off the bat that these are not slams, and are not meant to discourage anyone from buying this kit. This is meant simply as information for those who want to build an accurate model. While a decent effort, Trumpeter fell down on several key details. The biggest potential pitfall I can see lies in the manner in which Trumpeter chose to add the new bow shape. 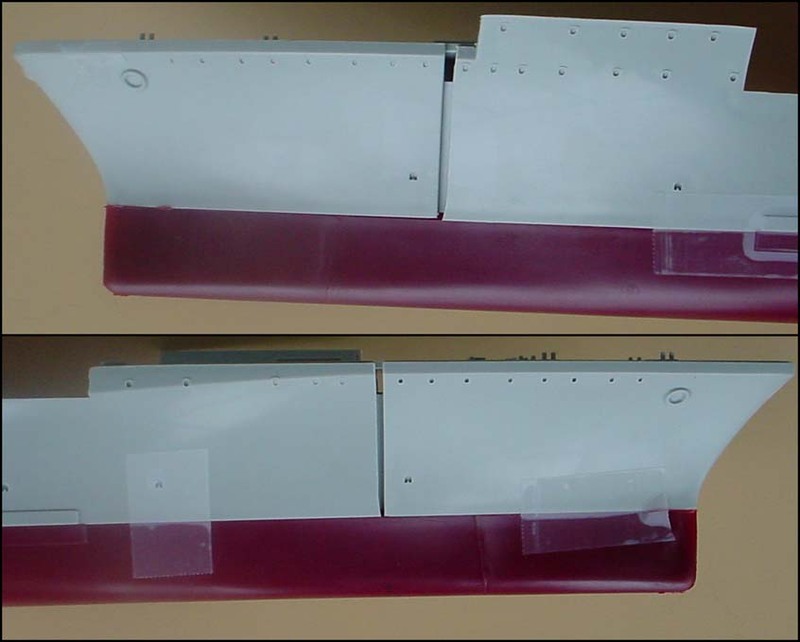 The chopped short hull may cause potential fit problems for builders; my hull cut was not straight, appeared to be cut a little short, and had a curve to the cut near the waterline that was probably the result of the plastic flexing during the cut. 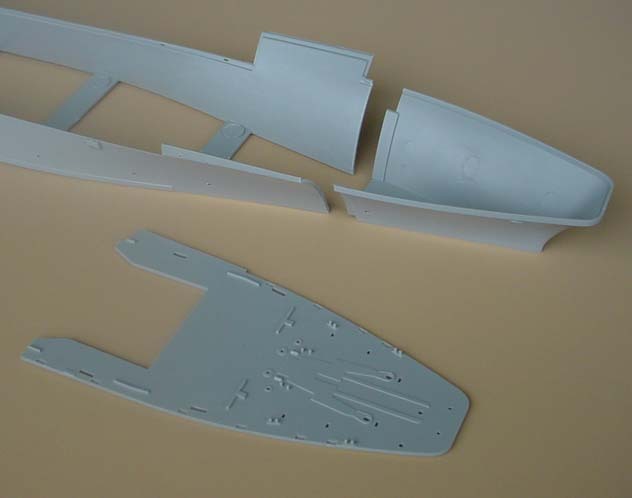 Originally I thought that it might be a simple matter of truing up the cut, but test fitting the new foc'sl deck and all three hull pieces revealed that the cut in the main section of the hull was about 1-1.75mm (1/32-3/32") too short, leaving a variable width gap about that much on both sides. It's hard to line to port side up correctly without the bottom hull, so I would advise waterline builders to at least tape the two upper pieces to the lower hull when trying to line everything up correctly, otherwise you'll have a bow section that's pointing off centerline. While Ticonderoga launched and went through shakedown with the shorter main deck, she had the length restored before her first war cruise. The length of the deck is correct for launch & shakedown, but not for any point afterwards. But even with that, one can't build her during her shakedown without some extra work as there were some cutouts in the deck on the port side that were present during shakedown that were filled before her war cruise. What Trumpeter molded is essentially early war by length, but late war by outline, at least on the Port side. There were three of these cutouts. Two of them were for the quad 40mm mounts that were next to the open 5"/38 galleries that were originally mounted higher than the 5" galleries in order to give them a better firing arc. These cut outs made spotting planes during landing and take-off more difficult and the mounts were dropped down so the cut outs could be planked over. My research hasn't nailed down an exact date but it was before she left the west coast for war in November of 1944. This is also true for the third cut out, a large one forward of the deck-edge elevator on the port side where the two quad 40mm mounts were on the old hangar catapult sponson. The original plans had been to mount an additional Mk 37 fire control director on this sponson, but the airgroup objected to this as it would have been a hazard to air operations. The mount was deleted but the structure was build for it any way to expedite Ticonderoga's completion. 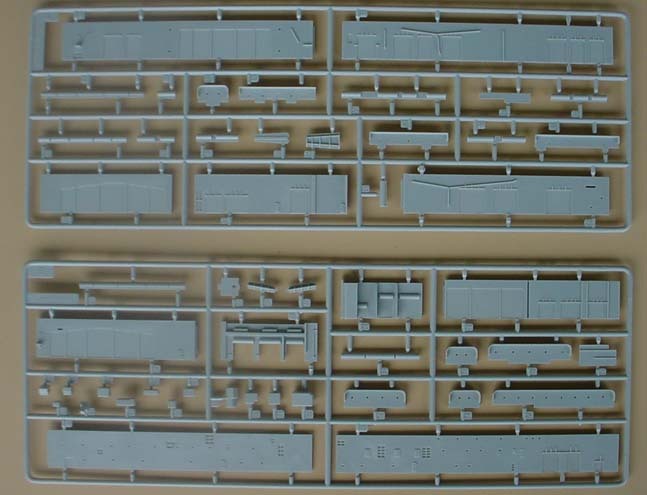 This cut-out is not molded either, another case of late-war outline on an early war fit. Another change to the flight deck is that the Mk 51s that were originally mounted between the quad 40s on the bow were moved up to the forward corners when the deck was extended forward. This was done as the new overhang severly limited their arc of effectiveness. A goof that Trumpeter made with quad 40s was the inclusion of two extra mounts in step 13, port side, aft of the deck edge elevator. This was a later addition that was not present on shakedown or her first war patrol. Easy enough to fix. Trumpeter provided a new platform for the bridge level of the island, but the shape of the bridge enclosure itself is still wrong. It's sort of a rounded off rectangle when it should be just a straight curve. It may not too noticable when the Mk 51 overhead is mounted correctly, but it noticably cramps the platform. The Mk 51 I mentioned earlier should be mounted so that about half of it hangs off the forward end of the bridge, which is different than where the kit's alining hole would have it. The hull itself has a minor problem in that the mount fot the hangar deck catapult is still present on the starboard side. This should be flush with a platform that was folded up in this area (see picture NH 92243 on the Navy Historical Center's CV-14 page. In some pictures this platform is actually hanging down. I found that the hull bottom's torpedo armor didn't line up with the upper hull's representation of the armor. 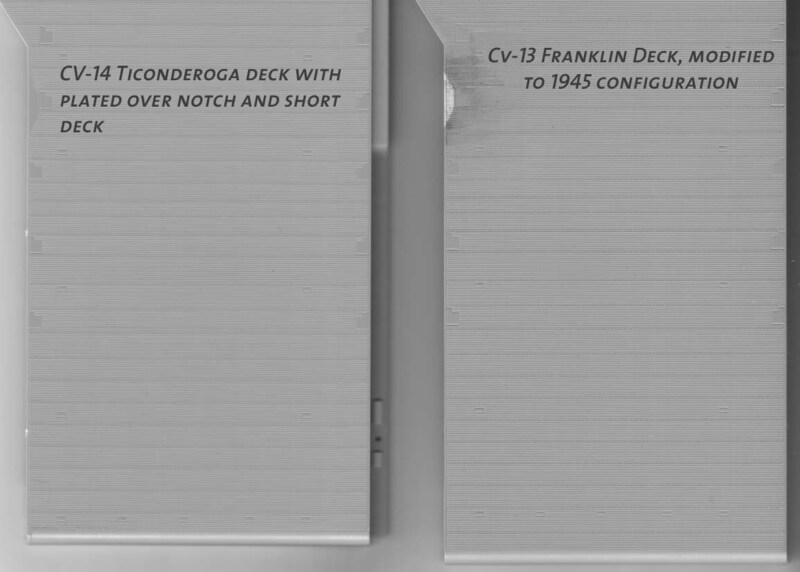 Ticonderoga never had SBDs so these should be used on another ship or to stock the spares box. The decals for the air group are incorrect in that they provide inverted triangles; correct for her 1945 patrol but not for her shakedown (which were just plane numbers and stars & bars) or first patrol (inverted chevrons, numbers, and stars & bars). The ship's markings are incorrect as well. 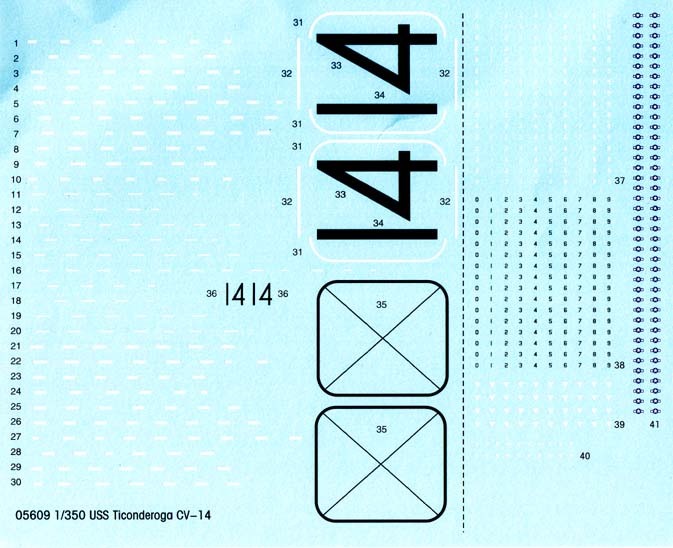 I can find no evidence that Ticonderoga ever had a "14" on her bow, so leave those off. The Deck markings position the center line in the wrong area and elevator markings are incorrect. Trumpeter has you run the centerline stripes through the center of the rear elevator and a simple "X" intersect with it; in actuality this elevator wasn't mounted on the centerline of the deck and the deck itself wasn't centered on the hull. So the "center line" actually ran to port of the elevator centerline, and the centerline of the elevator had its own *solid* centerline. Finally, there were two 20mms on the main (hangar) deck level starboard side, aft of the rear crane. This was common on some of the other ships of this class so reference shots should help you with the fabrication of the missing splinter shield should you decide to add this feature. While by no means a bad kit, and a nice subject to have, this kit will not be as easy to build as the earlier short-hull releases. I can only hope that Trumpeter changes the deck and bow cut in whatever late-war long-hull they decide to produce. I recommend this kit to anyone who wants to do a long-hulled essex, but I must admit that I am a bit disappointed in this release as it uncharacteristically does not follow Trumpeter's pattern of noticeable improvement with each release. Even the box art is a step back; it's just not inspiring at all. Kit via Skyway Model Shop, Seattle and my wallet. While some of the research for this came from my time at the National Archives, the vast majority came from Classic Warships' Excellent Ticonderoga book.